I am new to file maker. 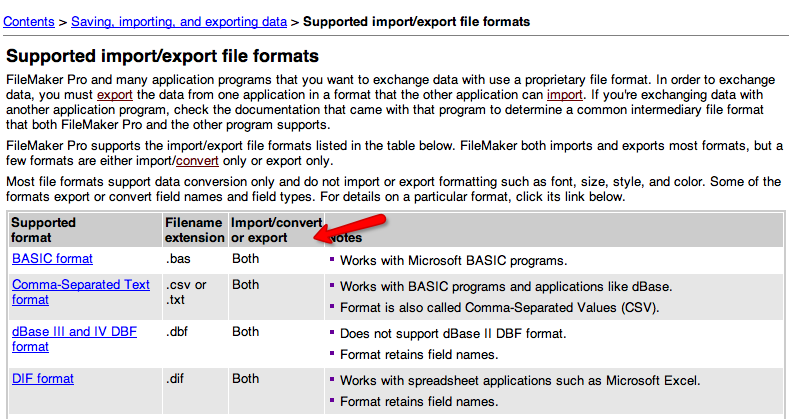 I am trying to migrate data from File Maker 6 Table to a csv file. I am using Export Records -> choosing the csv file as file type and saving all the fields. When I go to the csv file, I am not able to get the equivalent field names at the top row. Is there an option that needs to checked to get the field names included in the csv file. For information about the different File Formats, and what you can expect when using the one. The link talks about the format in which I would be getting the csv data. But, it does not say anything about the inclusion of field names in the first row along with the data. Is there any way I can get the field names in csv file. Good export format for creating form letters in a word processor. I'm not sure that you went to the correct section, you have to look for the title I used in Blue above. Note, the file cut off the one that Fenton mentioned. However, you should review ALL of the Formats listed, as it will help you today, and in the Future with your imports and exports. I went to the correct section. The only difference is that I should have looked at all the formats. I only looked at csv format and it did not list that it will be including the field names. As mensioned by Fenton, .mer file will do the job for me as it has the same structure as the csv file with the header present at the top. I will try it out and update the post.